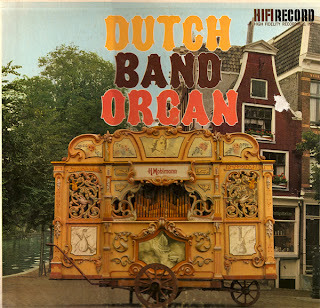 Dutch Band Organ is different! All Band Organs are a "gas," quaintly tootling and twittering away, but this Dutch variety is even more so. You have heard Band Organs in carnivals, circuses and fairs. The picture on the front cover will remind you. The straightforward melodies, crazy arrangements and frequent "clams" are nostalgic, taking you back to the fun days of your youth. In Holland, a Band Organ is a thing of achievement. There are lots of them and the builders take much pride in outdoing each other. The particular instrument recorded here is the Pride Of Amsterdam, the best of them all! The process of making the music is interesting. After selecting tunes for this album, the list was sent to a roll maker who cuts by hand the appropriate holes in paper rolls which actuate the notes of the instrument as the roll progresses over a tracker, something like an ordinary player piano. The roll cutter in this case, incidentally, is a prominent Amsterdam attorney who cuts rolls as a hobby (try that one!). After cutting, the rolls were played on the Band Organ in a live room for the best sound. By the way, stereo recording equipment included Neumann microphones and the best of other European recording gear, all of which is PLENTY good. The very original adaptations and arrangements of the tunes played is remindful of the difference between domestic and imported Dutch beer. Anyway, make yourself comfortable for listening, put this album on your player and you will soon get the idea and want to listen over and over again! I have this LP and enjoy it once in a while. This band organ has a different sound than the "normal" band organ associated with a "merry go round".